PBR - Reports surfaced over the weekend claiming the Phillies may have interest in moving Cliff Lee before the trade deadline if they come to an agreement with Cole Hamels on a long term contract. Hamels and the Phillies are negotiating a deal that possibly would keep the 28-year-old in Philadelphia through 2018. At this point, however, nothing is official. The deal figures to be something near six-years for $145 million. Lee signed a five-year, $120 million deal with the Phillies prior to the 2011 season. He's still owed $98 million, including $25 million next year. Hamels' yearly salary projects to be similar if he remains in Philadelphia, leaving the Phillies in a tough financial spot. As currently constructed, the Phillies have approximately $112 million in salary commitments for just 12 players in 2013. If Hamels signs and is owed $25 million (as expected) the salary commitments jump to $137 million for 13 players. The threshold before clubs have to pay the luxury tax is $178 million, meaning the Phillies will have $44 million remaining to spend on 12 players to fill the 25-man roster. If the Phillies were to exceed $178 million they would be required to pay a 20 percent tax for every dollar they surpass the threshold. 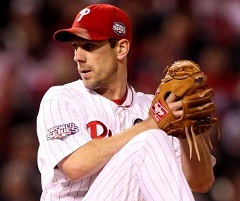 Aside from Hamels, Cliff Lee is arguably the Phillies' biggest trade chip. He's a proven All-Star with postseason experience, plus he is under contract for another three seasons. Ironically, the remaining dollars attached to his contract put a damper on his appeal to other clubs. If the Phillies moved him it's likely they would have to chip in and pickup a big portion of his remaining salary. It's no secret Lee is having a down year, but he's still one of baseball's premier left-handers. According to CBSSports.com's Jon Heyman, Lee has a 21-team no-trade list in his contract, meaning he has say in nearly any possible deal. Trading Lee is a difficult proposition. His contract is hefty and his value is too low right now to get comparable talent in return, but does it make sense? What about the window of opportunity? If the Phillies have one last season to make a championship run with the nucleus of Ryan Howard, Chase Utley, Roy Halladay, et al., doesn't it make sense to keep Lee and go all in for one final season? At this point, only Ruben Amaro Jr. truly knows.